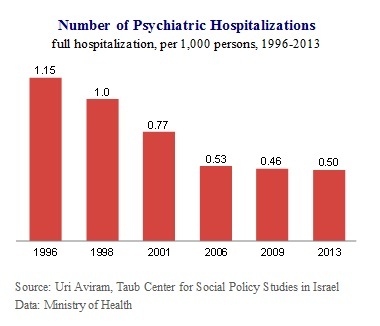 A new study by the Taub Center for Social Policy Studies in Israel points out critical issues for the success of the reform, and warns that failure to address these issues might worsen the state of the mental health system in Israel . 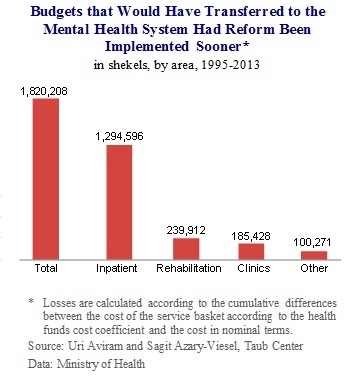 From 1995 until 2013, the mental health system has “lost” NIS 1.8 billion – the difference between the budget that the system would have received if the previous reforms had been implemented on time and what it actually received. The budget for community rehabilitation for the mentally disabled soared from 2% to 25% of the overall government budget for mental health. As such, the percentage of the total mental health budget comprised of inpatient psychiatric care fell from 80% in 1999 to 59% in 2013. Despite the reform’s plans to expand services within the community, the governmental budget for mental health clinics fell by 40% between 1999 and 2007. Since 1996, the rate of full psychiatric hospitalizations has fallen: from 1.15 hospitalizations per 1,000 persons in 1996 to 0.5 in 2013. In July 2015, a new mental health reform went into effect in Israel. This reform, which shifts responsibility for the insurance and treatment of inpatient and ambulatory mental health services to the health care funds (HMOs), signals a meaningful change in mental healthcare services in Israel. Research by Prof. Uri Aviram, a Taub Center for Social Policy Studies Policy Program Fellow and former head of the Israel National Council for the Rehabilitation in the Community of Persons with Mental Disabilities, and Sagit Azary-Viesel, takes an in-depth look at the mental health system prior to the reform and the circumstances leading to its implementation, and points out critical points to ensure the reform’s success. There was a substantial decline in psychiatric hospitalizations, that is, more patients were being treated in the community – although outpatient care budgets saw no commensurate increase. The reform integrates mental health services into the overall health system, and aims to apply the system’s principles of justice, equity and mutual care to the mental health services as well. One of the foundational principles of the reform is to move the locus of care from psychiatric hospitalization, which often removes the patient from the community and possibility of leading a fulfilling life, to community-based rehabilitation services. According to the Taub Center study, following the previous mental health reform there was a decline over the years in the rate of full psychiatric hospitalizations – from 1.15 hospitalizations per 1,000 persons in 1996 to 0.5 in 2013. The length of hospitalizations was also shortened, and overall annual psychiatric inpatient care days declined significantly. In parallel with the decline in inpatient care numbers, there was a substantial increase in the number of those treated within the community. While the budgets of the psychiatric hospitals did not change over the period, the relative portion of inpatient psychiatric care from the overall government budget for mental health care declined from 80% to 59%, since the budget for rehabilitation services rose sharply: from only 2% in 1999 to 25% in 2013. Despite the intentions of lawmakers to strengthen ambulatory care, the budget designated for clinics in the period preceding the reform was reduced from 13% to 9% of the government mental health budget – a move that negatively impacted the availability and accessibility of clinics, and an issue that should improve with implementation of the newest reform. The effort to initiate foundational reform in mental health services and to shift responsibility from an inpatient-based service to the community-based health funds has been ongoing for close to four decades. The current reform is the fifth attempt to change the system. 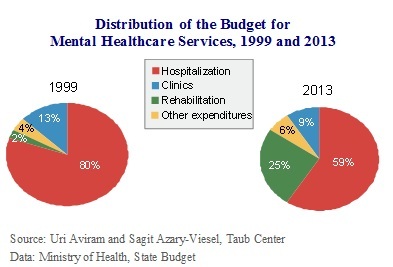 In Aviram’s estimation, the past failures prevented the mental health system from receiving a larger budget; from 1995 to 2013, the mental health system lost NIS 1.8 billion – the difference between what the system would have received if its budget had been updated along with the health funds’ budgets, and the budget that it actually received as part of the government system. One of the aims of the reform is to double the rate of those receiving mental health care in clinics to 4% of adults and 2% of children. Those in the health funds consider this estimate too low and unequal; in some city centers and among more well-off populations, the rates are higher than this target already, while in other places, primarily in the geographic periphery and among specific population groups, like Haredim and Arab Israelis, the rates are far from this target. According to Aviram, it is imperative to identify how realistic these targets are. One of the demands made of the health funds was to provide those in need of treatment with mental health services within a reasonable amount of time and at a reasonable distance from their home. This flexible delineation has been the subject of a great deal of criticism, including in the State Ombudsman’s 2015 report. The absence of a clear definition of these terms is very serious for the psychiatric population, generally considered particularly disadvantaged and suffering, in addition to their disabilities, from issues of stigma and social marginalization. Reform advocates must pay close attention to this subject and should define these concepts more clearly, as was done in the dental health care law. There is a lack of agreement regarding the length of treatment in the framework of the reform, which sets nine visits for an adult and twelve visits for a child, and whether this defined treatment period is sufficient to meet patients’ needs. There is also a difference of opinions regarding who should be responsible for determining the length of treatment. The reform includes an option for privately funded mental health services. While the fee is regulated, it is nonetheless significantly higher than the copayment in public healthcare clinics. This fact raises concerns that a two-tier system will develop where those who can afford to pay will buy private care, and this will lead to differences in the quality of therapists and treatment in the public and private systems. There is no doubt that this situation goes against the principles of the reform, and it is important to track developments and prevent the growth of special, higher-quality mental health services only for those of means. One of the underlying ideas of the reform was to connect family physicians to the mental healthcare services. Many in the field, however, feel that family doctors are not ready or able to take on this added responsibility. In their words, they do not have enough knowledge, there is not enough time to train them for this, and they are not given enough time per patient to deal effectively with the needs of those suffering from mental illness. The reform was set in motion without the full cooperation of family doctors, and they claim that their professional union was not engaged, either. Moreover, during the deliberations on the reform, the psychiatric internship requirement was removed for doctors specializing in family medicine. In light of this, it is very possible that connecting family medicine could be problematic since the involvement of family physicians in the mental health system was an important part of the reform plans and goals. In light of the structural changes involved in the reform, there is a question regarding the transfer of information. There is a need to pass patient information to the new authority, while at the same time ensuring the patients’ right to privacy. The director-general of the Ministry of Health has recently decided that it is not possible to get patient permission and that the information should be transferred to the health funds unless the patient specifically objects (and since the mechanism is not yet finalized, it is not even clear if the patient will be asked). It is reasonable to assume that the health funds and other agencies will try to find and develop alternatives to hospitalization, out of the desire to keep patients in a less restrictive environment (needs permitting), as well as out of a desire to cut costs. Alternatives could include clinics as well as outpatient departments in psychiatric hospitals in the community. However, the Taub Center study showed that in the past decades, no new clinics or psychiatric hospital outpatient departments were opened and, to date, no government-funded psychiatric hospitals have been closed. As such, there is no way of knowing how the State will act – particularly in light of the conflict of interest, since the majority of hospitalization and community rehabilitation services remain in the hands of the government and under the authority of the Ministry of Health. It is unclear how this will be resolved. What will happen, for instance, if the Ministry of Health, as the owner of a psychiatric hospital, wants to maintain its level of activity while the health funds are seeking to curb inpatient referrals and find alternatives? In summary, Prof. Aviram says: “In order to support the reform’s implementation in line with its original goals, it is imperative to gather those social and political agents for whom this reform is most important and to create a social-political lobby to work for this. In addition, within the Ministry of Health there needs to be a supervisory agency to oversee the reform’s implementation, to strengthen the existing regulatory bodies that were created for this purpose, to respond appropriately to the issues that arise during the implementation phase, and to encourage unbiased evaluation of the reform’s results and achievements.